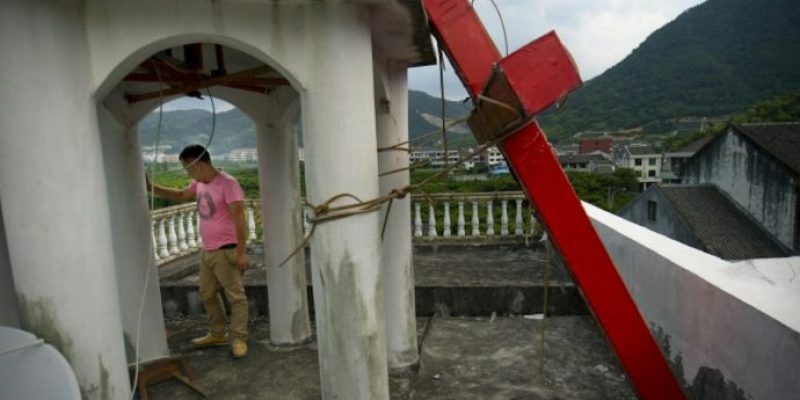 In recent months the communist government of China has increased persecution of Christians. Asia Harvest, a ministry helping Chinese Christians, recently reported that it “received an unconfirmed report from a long-term China missionary” who claimed that the government had murdered 314 house church Christians in recent months and hundreds more are missing. Most house church leaders have gone into hiding, Asia Harvest reports, even going so far as to disconnect their phones and other electronic devices to avoid government surveillance. Additionally, thousands of house churches– which are considered “illegal,” have closed. Chinese officials have also reverted to 1960’s-era policies of removing crosses and Scripture posters from public places and replacing them with Chinese flags or pictures of President Xi Jinping. It’s not just Christians who are targeted, however. Anyone who associates with them are punished as well. Landlords who rent buildings to Christians are heavily fined by the government– between 20,000 to 200,000 Yuan– nearly $30,000. Financial costs associated with Christianity have not only created a climate of fear, but also resulted in the forcing out of Christians from the premises they rented. The most severe persecution to reported comes from the northwest region of Xinjiang, China, in response to the spread of Christianity. In recent years, church houses have sprung up among the Uyghur, Kazakh and Kirghiz people groups. Today, most of their leaders have been arrested and taken to concentration camps. News organizations estimate at least one million Christians are being detained and tortured in those camps now. Inmates also initiated a hunger strike. Chinese authorities denied in August that it had detained one million people. The suburbs around the cities of Urumqi, Hami and Kashgar have reported massive depopulation and countless empty buildings have been boarded up. The BBC News reported that human rights groups say detainees are made to swear loyalty to President Xi Jinping and renounce their faith. The New York Times quoted former detainees saying they were forced to sing songs like, “Without the Communist Party, There Would Be No New China.” Those who couldn’t remember the words were not given breakfast.